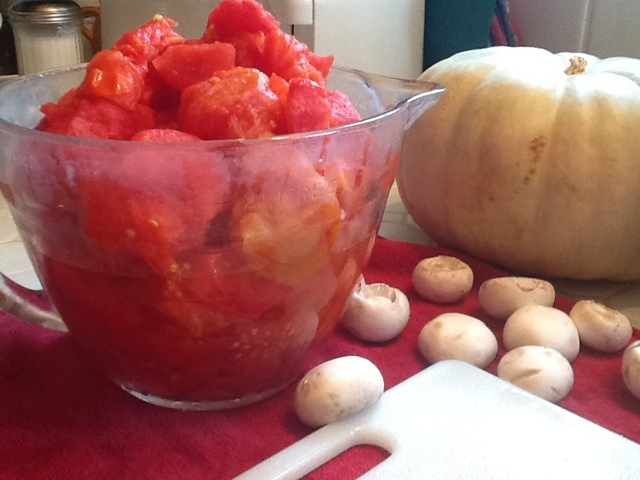 A cold, overcast Sunday is a great time to make spaghetti sauce. It's also a great time to clean out the freezer a bit by using up some of the frozen tomatoes from last summer. Farmer MacGregor makes great sauce. Not typical Italian sauce. No. This recipe comes from his Hungarian grandmama. And it's my favorite. I have never found an Italian sauce that I like better than this. The sauce cooked for a few hours then I lit the BBQ mesquite to cook some steaks and garlic bread. Delicious with a green salad. Farmer MacGregor cheated and bought lettuce at the grocery store rather than pick from the garden. It was good just the same. I'm glad I discovered freezing tomatoes. I simply wash and dry ripe tomatoes and place them in a freezer bag. When you're ready to use them, fill the bag with warm water to defrost a little. With a sharp knife, remove the core and skin. Voilà! Use the summer beauties as you would canned tomatoes. There is a secondary use for frozen tomatoes. Should you need, these would knock someone out if you beaned them with a sack of frozen 'maters. They are like cue balls. This summer, I will only be growing tomatoes in containers as I am trying to eradicate the raised beds of nematodes. I so love those home grown tomatoes.....never have a big enough crop to freeze any though. Good luck with the pots. I ha ve found "Early Girl" to be a great producer with a long season. You might consider trying her. Glad you liked the Pickle Slicer. I freeze my tomatoes too, saving them up until I have enough to do a batch of sauce or salsa. I core them, and then cut an "X" at the bottom, then when they defrost, the skins just slip right off. We don't get as cold temps as you do, so our tomato plants (the cherry ones anyway) are still bearing. *Lo - you're a joy. *Laura - Farmer MacGregor is not relinquishing his recipe at this time. I don't even know how to make it. Sheesh! *Aunt - We need much more cold up this way still along with rain/snow.